Oh, I do love a rainbow – and these little beauties were no exception. But not only are they beautiful, they are good for you too. Bryony recently added a listing to the Health Foods and Supplement Directory and I was intrigued by these lovely little jars. A was delighted when Bryony offered to send me a sample to review. The little 20g sample pot arrived a few days later. It was so pretty, I just wanted to leave it on my desk and admire it! 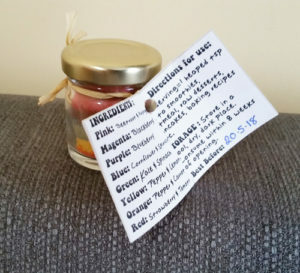 This is a tiny jar, and yet it contains 14 varieties of raw, dehydrated and powdered fruit and veg, and even an edible flower, within the colourful layers, all detailed on the little attached leaflet. 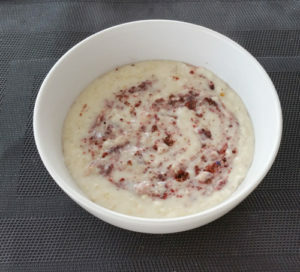 The instructions suggest adding 1 heaped teaspoon to a smoothie (it is often referred to as an essential smoothie sidekick), porridge, raw desserts, pancakes and baking recipes. Bryony also told me that many people stir one or two teaspoons in to a glass of warm, cloudy apple juice. When I finally opened the jar, there was another surprise: three little herbal tea bags had been used as ‘packaging’ to keep the layers in place during transit. Bryony explained that for local fairs she’ll often use popcorn instead. She is a big fan of zero-waste and plastic free, so she uses all natural, recyclable, reusable or compostable materials in her products. Now I must admit, I was a little concerned that my love affair with this product might come to an abrupt end when I tried it as recommended. But I was so wrong. The flavour was amazing. Bryony has skillfully blended her products so that the natural sweetness shines through without any one product overiding the flavours. I certainly couldn’t taste kale or spinach in my porridge! It’s a little bit difficult to describe the flavour, but think perhaps a nice glass of red wine – without the alcohol of course. If you or the kids are struggling to get your 5-a-day, this is definitely a good solution. But even if you are good with your fresh veggies, think of all the exciting things you could do to add a little bit more goodness, flavour and colour to your meals, snacks, baking and smoothies. But one comment I feel I must make: don’t buy a 20g pot, unless you want to keep it permanently as a decoration. Go straight for the 100g or 150g options. You won’t regret it! 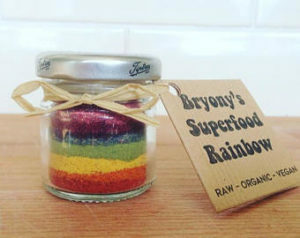 You can purchase Bryony’s Superfood Rainbow via Etsy or visit her website for more information. 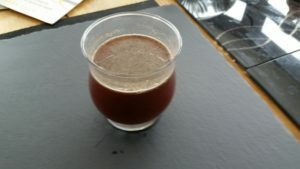 My large pot of Superfood Rainbow arrived yesterday with a free sample of a winter warmer mix. I have only opened the little pot of winter warmer so far. Yesterday I added it to a homemade banana and almond milk smoothie and today I added it to my porridge oats. Delicious!